I am on Spring Break and my little guy and I are just laying low. I started a Kindergarten Hoppenings Facebook page. I have no idea why. My husband said "it's about time"....again, I don't know why. But, here is the link https://www.facebook.com/KinderPond, you can HOP on over and like it. I will be doing a Facebook Launch giveaway...probably tomorrow....maybe Friday....ok by Saturday. The giveaway be for one follower and one, um, "liker?" on Facebook. It took me a while to come up with something to giveaway, so here's hoping it will be worth your time, lol. More details to come! 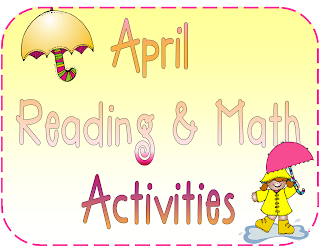 Michelle Rist over at Inspired by Kindergarten is giving away her April Reading and Math Activities. You know me I am loving a good freebie! Check back soon for some giveaway details! Thanks for mentioning my freebie! Love, love. love your site! Thought about doing a fb page myself for my blog. Just haven't gotten around to it yet. I'll be sure to check yours out!